Life is a matter of energy and information—lots of information—more specifically, the hereditary information stored in the DNA that is present in all living cells. Thus the coding capacity of the nuclear DNA found in every mammalian cell is equivalent to some 700 Mbytes. This information has accumulated and been successfully transmitted over billions of years of evolution. For researchers like Dieter Braun (Professor of Systems Biophysics at LMU) who are interested in understanding how life on Earth originated, one of the many questions this raises is how the very first informational molecules that were formed under prebiotic conditions could have outcompeted their many rivals with much smaller information content. In this way, depending on the relative concentrations of the complementary sequences, the stage is set for intermolecular cooperation. 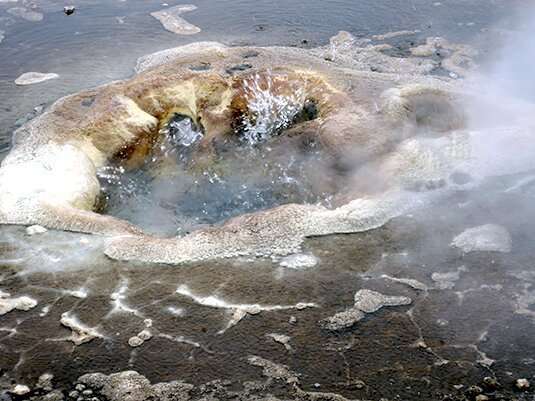 Higher temperatures and steep temperature gradients—like those that are thought to have characterized the narrow, water-filled pores in volcanic rocks in which primordial DNA synthesis may have occurred—promote the stringing together of shorter molecules into longer sequences. This would allow faster selection, elongation and subsequent replication of longer molecules. In other words, templated ligation can create stable majorities by promoting the assembly and replication of sequences that are complex enough to encode the first genetic information. For the authors of the new paper, "these cooperative ligation networks provide an example of symmetry breaking, a well-known mechanism of structure formation in physics," says Braun.